Table runners There are 6 products. With your embroidery needle, dusted with snow, you can embroider this village together with the flowers and their hint of mother of pearl to give your Christmas table a truly warm, festive air. The Aida material, married to the poetic design, will help turn your Christmas meal into the most attractive of festive occasions. These exquisite cupcakes will be perfect for the festive season! 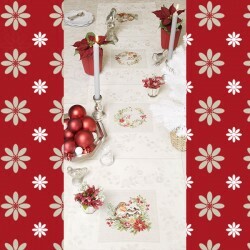 Delicate, appetizing and elegant this table runner will "wow" your guests! A gracious garland winds its way through flowery cakes and pastel macaroons…. When indulgency is dressed with such elegance and romanticism, it becomes purely divine! You can lay your cards on the table – this is the best dining address in town!! Made from 12 count 100% linen, this ecru and grey table runner with red grid measures 64 cm by 152 cm.Washable at 40°. Threads and needle are not included. 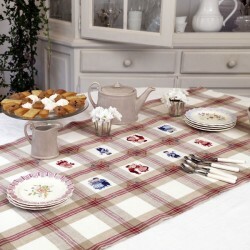 The pattern symbols and colors are included with the table runner. Made in France. 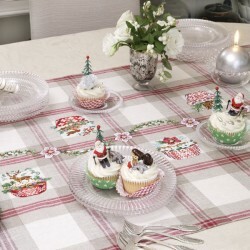 Full of gaiety, these characters are dancing on the table runner. Once embroided in red and blue, they will give a touch of color and joy to your table, set to have a cup of tea with friends or a casual dinner. 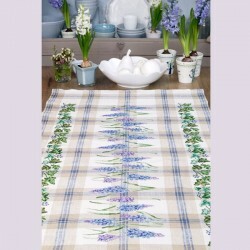 This long table runner with graceful tiny bells of Muscaris, will bring a wonderful imaginary garden to your house. Simply placed on the table it will charm everything around.